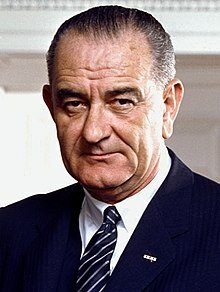 Place of Birth: Stonewall, Gillespie Co., Texas, U.S.
Place of Death: near Stonewall, Texas, U.S.
Lyndon B. Johnson was an American politician. A Democrat, he served as the 36th President of the United States, from November 22, 1963 to January 20, 1969. He was elected to the position in 1964. He was previously the 37th Vice President of the United States, from January 20, 1961 to November 22, 1963. He was elected to the position in 1960. He took over as President upon John F. Kennedy’s death. President Johnson also served as a Member of the U.S. House of Representatives from Texas, from April 10, 1937 to January 3, 1949, a U.S. Senator from Texas, from January 3, 1949 to January 3, 1961, Senate Majority Whip, from January 3, 1951 to January 3, 1953, Senate Minority Leader, from January 3, 1953 to January 3, 1955, and Senate Majority Leader, from January 3, 1955 to January 3, 1961. He was a Presidential candidate of the Texas delegation at the Democratic Party’s national convention in 1956, a candidate for the Democratic Party’s nomination for President of the United States in 1960, and also participated in the Democratic Party’s Presidential primaries in 1968. He was Time Magazine’s Person of the Year for 1964 and 1967. President Johnson was the son of Rebekah (Baines) and Samuel/Sam Early Johnson, Jr. He was married to Lady Bird Johnson, with whom he had two children. His father was a member of the Christadelphian Church. President Johnson’s paternal grandfather was Samuel Ealy Johnson (the son of Jesse Johnson and Lucy Webb Barnett). Samuel was born in Alabama. Jesse was the son of John/Jesse Johnson and Ann Ealy/Eley. Lucy was the daughter of Leonard Barnett and Nancy Statham. President Johnson’s paternal grandmother was Eliza Jane Bunton (the daughter of Robert Holmes Bunton and Priscilla Jane McIntosh). Eliza was born in Kentucky. Robert was the son of Joseph Bunton and Phoebe Desha. Priscilla was the daughter of John McIntosh and Julia Miller. President Johnson’s maternal grandfather was Joseph Wilson Baines (the son of The Rev. George Washington Baines and Melissa Ann Butler). Joseph was born in Louisiana. The Rev. George was the son of Thomas Baines and Mary McCoy. He was a Baptist clergyman, who pastored eight churches in Texas, as well as others in Arkansas and Louisiana, and was the president of Baylor University, during the American Civil War. Melissa was the daughter of Nathaniel Cornelius “Nealey”/”Nealy” Butler and Amy Arina Iren’ee Ogier/Ozier, who was born in South Carolina, to an English father, from London. President Johnson’s maternal grandmother was Ruth Ament Huffman (the daughter of John Smith Huffman, Jr. and Mary Elizabeth/Elisabeth Perrin). Ruth was born in Texas. John was the son of John Smith Huffman and Susan/Suzanne/Susanna/Susannah Ament, who were of German, and some Swiss-German, descent. Mary Elizabeth was the daughter of William Joseph Perrin and Dycie/Dicea/Dycea Kirby/Kerbey. President Johnson’s matrilineal line can be traced to Helen (Eleanor) Jameson, who was born, c. 1775, possibly in Virginia. President Johnson was a sixth cousin, twice removed, of actor Shane Harper. President Johnson’s maternal five times great-grandparents, Hans Georg Ament and Anna Margareth Gemlich, were also the maternal seven times great-grandparents of Shane Harper. without any doubts he looked like typical turkish or afghan man ! Typical Afghan man…of course! You’re so funny.